Physical therapy evidence-based practice resources. Evaluate the effectiveness and efficiency of the process. how to appraise the evidence you find. Source: Strauss, S. E. Evidence-Based Medicine: How to Practice and Teach EBM. New York: Churchill Livingstone, 2005. Evidence-based medicine (EBM) or evidence based practice (EBP), is the judicious use of the best current evidence in making decisions about the care of the individual patient. 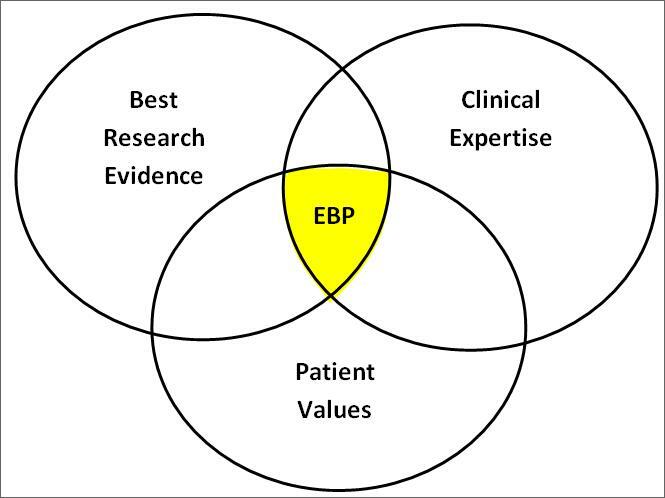 EBP also integrates clinical expertise and takes patient desires, values, and needs into consideration. Interested in learning more about EBP? Duke University Medical Center Library has produced an excellent EBP tutorial. EBP Image Source: Blevins, Amy. "What is Evidence-Based Practice?" University of Iowa. 2010. Used with Permission. Sackett DL, Straus SE, Richardson WS, et. al. Evidence-Based Medicine: How to Practice and Teach EBM. Edinburgh: Churchill Livingstone, 2000. Introduction to Evidence-Based Practice. Tutorial. UNC-Chapel Hill. 2014.